So what did I come up with? One dessert, one breakfast. Honestly though? Either one could be that. They were both not-so-sweet crisps, showing off the fruit and not a lot of sugar. One of my current goals is to wean back how much sweetener we use. I know, I used to roll my eyes at people who talked about “no sugar” cooking. Why suffer I thought. I get the point now though, during my quest to get us off processed food. We have no brown sugar left in the house. I haven’t bought powdered sugar in over 6 months (none in the house). A tiny amount of organic granulated sugar remains. Just in case. We are down to raw local honey, maple syrup and maple sugar. All of which are ungodly expensive, even in the bulk sizes I buy. Suddenly sweetening food isn’t so carefree. A cup of honey is a recipe killer, where a cup of sugar was “Dump it in the bowl!”. Sugar is cheap, looking at a jar of honey going empty is an eye opener. With every recipe I am cutting back, our taste buds are getting used to it. Consider this – a year ago when I’d make oatmeal I cooked the oats in vanilla almond milk (the sweetest) with lots of sugar added while cooking and then more on top. Now I use unsweetened almond milk and half the added sweetener. Overall I cut the sugar back by ¾! Having said that……if you are used to sugary food you will probably want these sweeter than called for. And that is OK!! For our dessert I made individual crisps and had them for two days. We drizzled on a bit of maple syrup before eating, over the top. The crisp is best chilled. Yum! I had a small basket of plums from my favorite farmer that she had just picked. The deep color and taste went nicely with the peaches. But as I mentioned, you might want it a bit sweeter, plums are often tart. So taste the fruit and add a bit more maple syrup if desired. 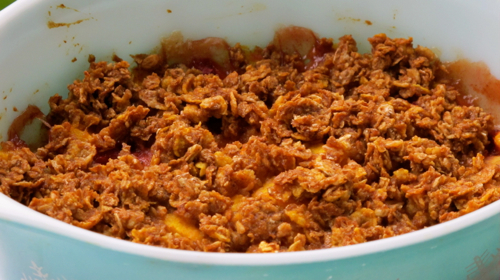 Toss the peaches and plums with the filling ingredients, set aside. In a small mixing bowl toss whisk the oats and flour. Whisk the oil, maple syrup, water, vanilla, spices and salt together, drizzle over the oats and stir with a fork till coated. 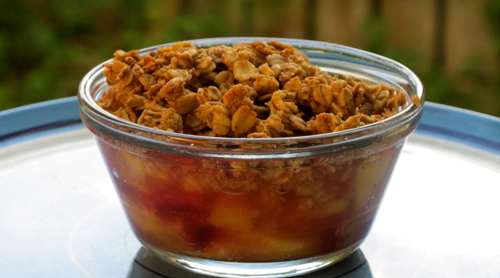 Add ½ cup of the topping to the fruit bowl, stir to mix together. Divide the fruit between 6 to 7 ramekins (custard dishes), divide the topping between the cups. Set the ramekins on a large rimmed baking sheet. Bake for 35 minutes, until golden and bubbling. Let cool a bit before eating or chill for later. Drizzle a bit more syrup on top if desired. Makes 6 to 7 ramekins. This turned out amazing – I would eat it for breakfast, dessert, snack……but breakfast it was, served on a bed of honey greek yogurt! My cheating was using a commercially made breakfast cereal. I’ll admit it: it is hard to break some habits and when I saw boxes of the cereal I used on clearance at the grocery store for cheap, it was hard to pass it up. I know, I know….bad Sarah. You could use just plain old-fashioned oats or granola instead, or any whole grain cereal you have on hand. Mix the filling in a large bowl, set aside while you prepare the topping. 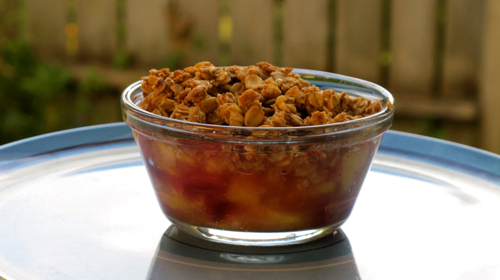 Mix the topping up in a small bowl, spread the peaches in a 1½ quart shallow baking dish. Top evenly with topping. Bake for 45 minutes. Let cool and refrigerate. To serve, stir up the container of yogurt, divide between 2 plates, swirling to make a bed. Top with the crisp. Way to go on cutting back on the sugar. It’s amazing how your sweet tooth can change. Some things taste ridiculously sweet now. Hah, I was thinking of that! You are certainly one creative woman! I love these individualized portions! a big hit! And to use this crisp as abreakfast is even more a winner: Heavenly !! I agree, it has been very hard for us. But…I noticed that by giving up on white & brown sugar it didn’t feel like I was “depriving” us 😉 Now I am working on scaling back on the maple & honey. What was odd is I had a piece of cupcake the other day, at the grocery store – a sample platter. It was SO sweet it didn’t taste good. It was then I knew our taste buds had changed. I’ll try to not become too weird … lol!! This looks delicious – thanks for posting it. I am always looking for healthy vegan deserts, I usually end up with fruit salad and soy yoghurt.